A trip to Portugal’s second city doesn’t have to be expensive—in fact, it’s easy to have a great time on a very skinny budget. Here are ten things to do in Porto that cost under ten euros. No visit to Porto is complete without sampling the delicious, artery-hardening dish the city is famous for. The Francesinha is a sandwich unlike any other, filled with ham, sausage, and steak, covered in melted cheese, doused with a thick tomato-and-beer sauce, often topped with a fried egg, and served on a bed of fries. Every local has their favorite restaurant, but popular spots include Café Santiago and Cape Negra. Francesinhas are typically served with a small glass or two of local beer, and the combination pretty much guarantees the need for a nap shortly afterward. Don’t plan to do much sightseeing after your meal! Equally famous in Porto is the drink that bears the city’s name. Port wine has been aged and exported there for hundreds of years, and it’s hard to find a bar or restaurant that doesn’t have it on the menu. 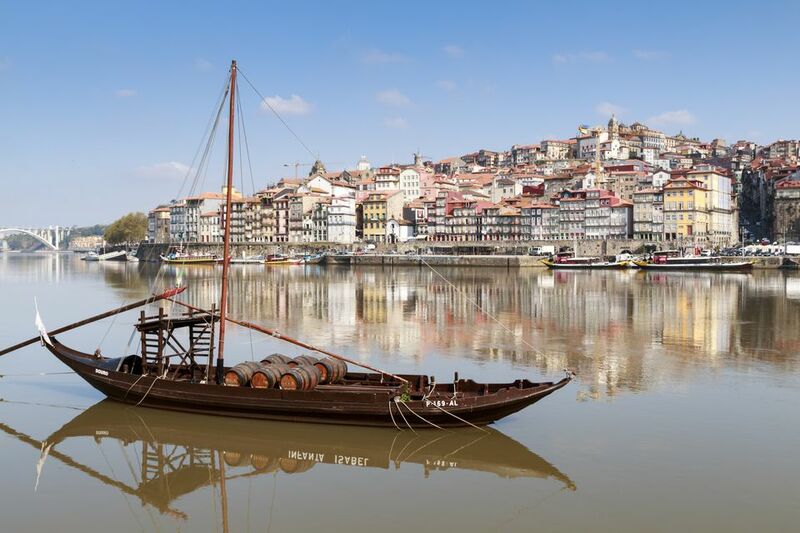 To learn more about its history and impact on Porto, visit the Port Wine museum, located in an 18th-century warehouse on the banks of the Duoro river. Tickets cost €2.20 on weekdays, and are free for children, seniors, and on weekends. The museum is closed on Mondays and public holidays. If all that learning about port wine has got you thirsty, follow it up with tasting a few samples. Several of the cellars on the opposite side of the river run tours and tastings, where you’ll typically get to try around three different varieties of port, often paired with local cheeses. On a sunny day, check out Porto Cruz—while the port tasting itself is no different to other places nearby, it's worth sticking around for a meal or cocktail on the roof terrace afterward. With fantastic views to the Dom Luís I bridge and back across the old part of the city, it’s the perfect way to spend an hour or two. If the idea of climbing up and down 225 steps doesn’t put you off, a visit to the top of Torre dos Clérigos (Cleric’s Tower) is a must. Dating back to 1763, the baroque bell tower is 250 feet high and offers spectacular views over the old town and river. Tickets to the tower and museum cost €4 for adults, free for children under 14. There’s also a €6 ticket that includes access to the church and a guided tour. The tower is open from 9 a.m. to 7 p.m. year round, other than restricted hours during the Christmas and New Year period. Looking for a free activity? Porto’s botanical garden includes hundreds of species of plants from all over the world within its ten acres, including a succulent garden and over 1500 feet of Japanese camellias. For the especially enthusiastic, it’s possible to book private guided tours in advance. The gardens are open from 9 a.m. until 6 p.m. during the week, 10 a.m. to 6 p.m. at weekends. While it’s possible (and indeed, enjoyable) to walk from downtown Porto to the coast, not everyone is up for the hour-long walk, especially in the height of summer. A popular alternative is the vintage number 1 tram, that slowly grinds its way along the river from the Casa do Infante in the old town, finally stopping near Passeio Alegre, a small manicured garden at the mouth of the Duoro. Single tickets are a reasonable €3, but try to get on as close to the start of the line as possible—the trams can get very busy in high season, and only run every twenty minutes. A stretch of sand is never far away when you’re in Porto. Matosinhos lies on the western edge of the city, and as well as being famous for its seafood restaurants, its beach is the ideal spot to work on your tan for a few hours. You can get to it from downtown by metro, bus, taxi or if you’re feeling energetic, on foot. Several lesser-visited alternatives lie along the coast south of Porto, easily accessible via a short train ride from São Bento station. More local affairs, these vast stretches of sand are often almost empty, especially on weekdays. Get off at Miramar station for a short walk to the beach (complete with a small chapel right on the water,) and a few simple restaurants and bars. If the glorious spiral staircase inside Livraria Lello reminds you of a scene from Harry Potter, it’s probably no coincidence. J.K. Rowling worked in Porto in the 1990’s, and locals suggest this bookstore was the inspiration for the Hogwarts library. Whether that’s true or not, this century-old shrine to books is worth a visit regardless. Get there close to opening or closing time to avoid the lines, as it’s a popular destination! Buy your tickets at the ticket office a few feet away—they cost three euros, which gives you a voucher for the same amount off the purchase of a book. The Dom Luís I bridge dominates the city skyline, spanning the river between Porto and Vila Nova de Gaia. At the time of its construction in 1886, it was the longest metal arch bridge in the world. It’s possible to cross the bridge on two levels. The lower deck leads straight from the riverside Ribeira area, crossable by road or foot, while the higher deck (with great views) is for pedestrians and trains only. If you’re creating your own walking tour, try strolling from the cathedral across the higher level of the bridge, down to the waterfront and port cellars, then back again via the lower level. It’s definitely the easier route! As well as being a major city train station, there’s another reason for tourists to visit São Bento: the gorgeous artwork in the entrance hall. 20,000 azulejos (blue painted tiles) adorn the walls, forming large friezes that tell the story of several important historical events in Portugal. It’s the ideal way to kill a few minutes while waiting for the next train!